Is a sequence of zeroes. Yeah. Definitely lots of potential. i’d like to do one for henon too, but it’s trickier. 2 params so it’d have to be a “bifurcation surface” … hard to read… might as well just say that it looks much “noisier” throughout - periods of different lengths are interspersed across the range of parameters. but IIRC the period is always >=2. also, in practical terms (@sliderule) i’d say if you want 1 output, 1 param, that henon oscillator is still useful and interesting if you just fix b=0.3 and take the newest value as output. oh! for all these deterministic, iterative things, i also think it’s kinda important for musical purposes to be able to arbitrarily set the running state at any time. this lets you take advantage of the coolest thing about these processes - which is that they are repeatable. pedantic point: it’s not strictly correct to say that some outputs of these functions are “chaotic” and some are “not chaotic.” being “chaotic” is a (somewhat subjectively-defined) property of the system, meaning just that it is a) sensitive to initial conditions, and b) orbits of different lengths lie close together in parameter space. 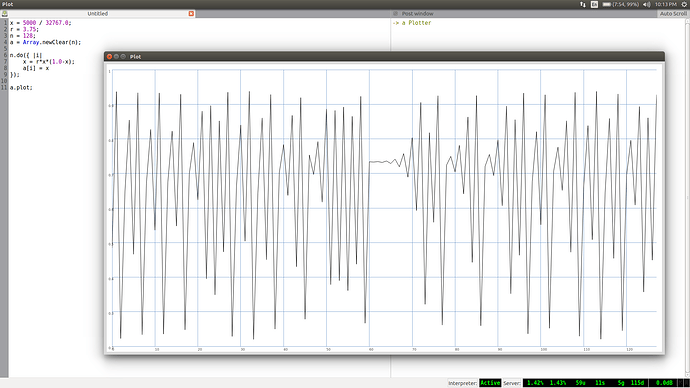 if you wanna refer to output sequences that are “noisier” you can say that they have a longer period or orbit. however, I guess it’d be reasonable to say, for instance, that above R=3.4 or something the logistic map “is chaotic” (orbits are closely spaced) and below that it is “not chaotic” cause the orbits are all basically the same. i’m still not super comfy with this because it emphasizes the subjectivity too much; your perception of “closely-spaced” is dependent on scale. Thank you for the “pedantic” explanation. I like the cubic map too and the Henon looks very exciting. Produces the chaotic sequence as a CV. Each call provides the next value as defined by the logistic map with parameter R.
Also I would like to give a strong vote for the BELL/GAUSSIAN distribution @sam suggested. Are there any would-be coders who would like to try their hand at implementing the algorithm? @zebra? I’ve got a full implementation ready with a broken logistic map (which is chaotic and predictable, but not correct), so it’s just the math left. Note that the test build not accurate but functional! When I last built a user-configurable chaotic oscillator, one thing that I implemented was automatic response to static zero conditions. Was useful in that context, not sure it will be here. hm ok, i’m looking and it seems like it should be correct. (sorry i don’t have TT hardware here right now.) in what way is it incorrect? Well I found one bug in the configuration of the operator callbacks. That fixes it! I’ll update the post above with a new build. As to 5000, are you sure you didn’t type 50000? edit: I might not have had the right commit pushed. Also, I chose 10000 so that it would be decimal-analagous. I had it originally at INT16_MAX/MIN limits but it wasn’t intuitive to use. to make that plot you mean? again, is there anything particularly bothering you about this? or do you just want to add more functions? Oh now that I fixed that one bug, I’m confident that it’s complete. That said, the structure is there and if you implement alternate choas_get_val I can make it pluggable. I’m not so mathy so if you have the skills and time to implement other algorithms, I can stitch CHAOS.ALG x together. also, sorry i’m honestly not really a teletype user. it’s all evolved rather a lot since the last time i even looked at the source code. slightly OT, but is it easy to tell me how to repeatedly bang an operator in the simulator? CTRL-D works, but is less than 20 characters. Yeah I can do the rest of the code so you can keep your changes to chaos.c/h. 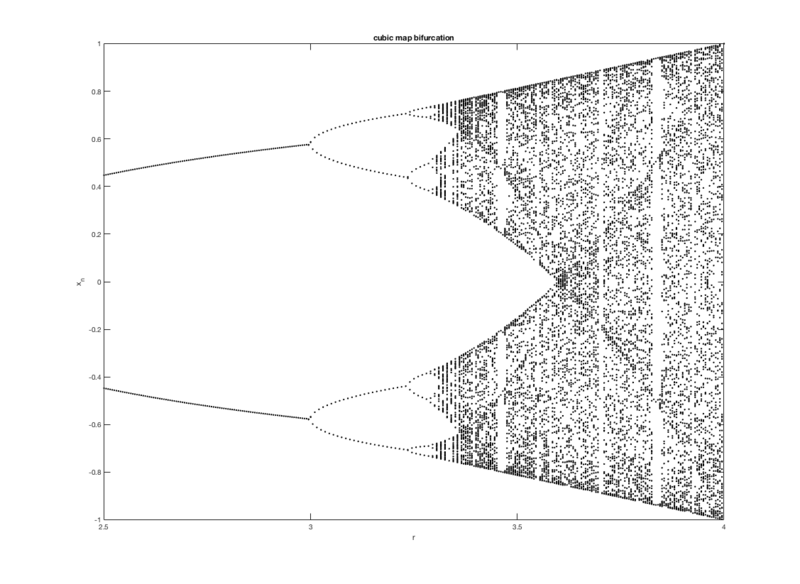 If you want to keep it simple, just make copies of chaos.c/h for each algorithm. Or separate branches and PR them all independently and I’ll handle the merge. 2 commits changed 2 files with 142 additions and 12 deletions. its incomplete, still need to do cell-aut mode. also more tests. i think i’m out of time for the moment though. ok, now i really gotta be done for the night. I am still missing a somehow comprehensible explanation of what this does. Just tried to install it to see if I can figure it out by myself but it seems to be just a cryptic text file…? When I change CV 3 CHAOS.R X (say from X 5000 to X 0) there seems to be a slew on the CV. Is that expected behaviour? CHAOS.R 5000 does not return a value. It is a setter. CV 3 CHAOS.R X is undefined, I think. 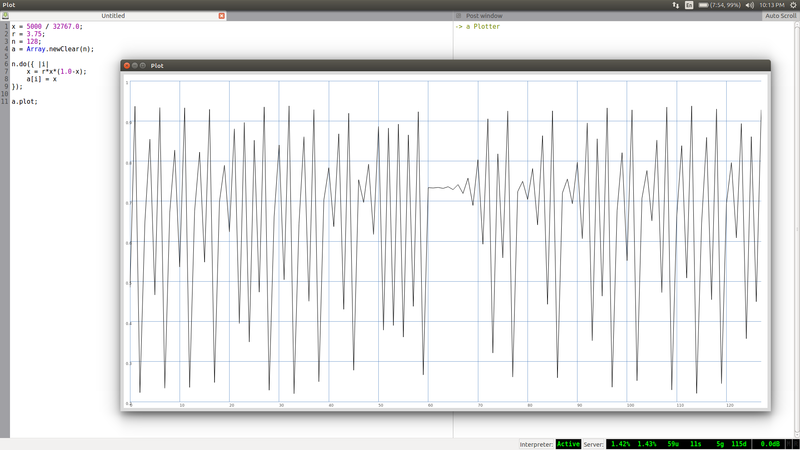 Then changing CHAOS.R in live mode from 5000 to 0. Also what strange stuff is happening when CHAOS.R is exceeding 10000? I find it a bit hard to guess where on the logistic map (i.e. the Feigenbaum digram) I am. Is there some easy maths to calculate this? I see that the resolution is much higher now but I liked the 275 = 2.75 ratio you first suggested. I understand it a bit better now and I think it is a good idea! and CHAOS seem to produce different output value ranges depending on the chosen algorithm. And why does only the cellular automata offer a 1:1 relationship between input values (0-255) and output values (0-255)? and be able to change the behavior/type of Chaos while maintaining the output value range I specified. I guess I am just not getting the point, so please help me understand where my thinking is wrong. Paging @zebra to the thread to explain!